The best-laid plans have astronauts returning to Earth on dry land when they hitch a ride on Boeing's CST-100 in the future, but NASA's emergency plans dunked the spacecraft in splashdown tests to ensure waterlogged astronauts would still find their way home. NASA's commercial crew program is counting on SpaceX's Dragon and Boeing's CST-100 to take over shuttling astronauts to the International Space Station in the not-so-distant future. While we've heard about the Dragon recently, so it's about time for us to check in on the CST-100. Boeing's space taxi is intended to return to Earth on land, but in an exercise of better-safe-than-sorry, NASA insists that the spacecraft are also capable of keeping astronauts alive through an unintentional water landing. 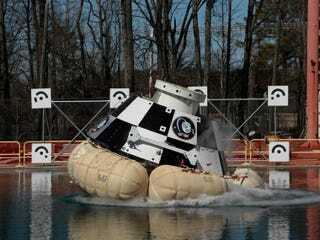 To that end, Boeing subjected its CST-100 to a splash testing in a massive pool at Langley Research Center in Virginia. While testing continues here on the ground in anticipation of first crewed flights in 2017, astronauts are reconfiguring the space station to accommodate their new rides.